I had a lowside crash a little over a week ago at 45mph and suffered a skin abrasion on my knee because the pavement wore through the elastic part of my bilt leather suit. The abrasion is kinda deep and I have been using this sort of gel bandage for the last week, but I can't tell if it's infected (I don't think so) or if it's healing correctly. Any help would be greatly appreciated. It is still oozing a watery clear/yellowish fluid and has formed these pimple looking bumps in the deepest part of the abrasion. I have tried leaving it uncovered to air dry but the pain is overwhelming, even with 3 ibuprofen... 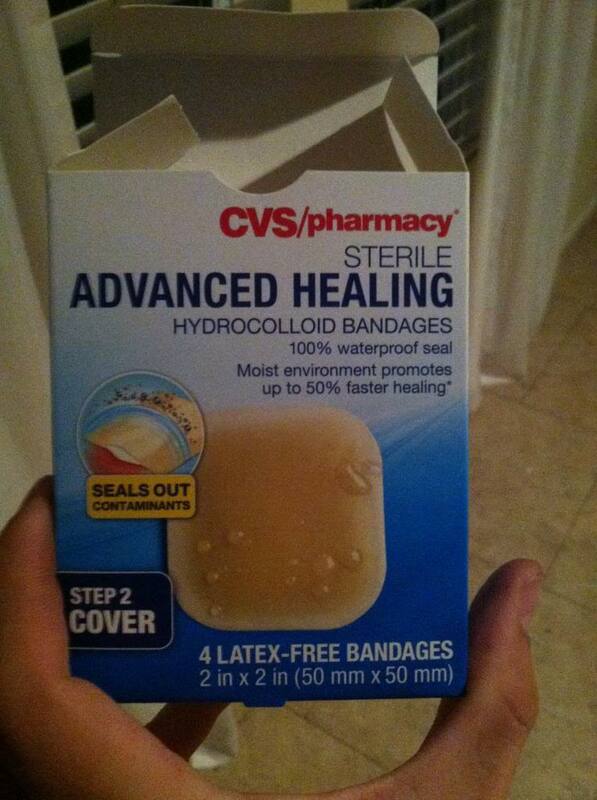 The only way I can do anything is to leave it covered with this CVS gel bandage thing. I would really appreciate any healing tips. Or even a timeframe of when it should stop hurting when uncovered (or hell even if it's infected). It's not oozing any different colored stuff than the day I crashed and there is no odor so I think it's O.K. 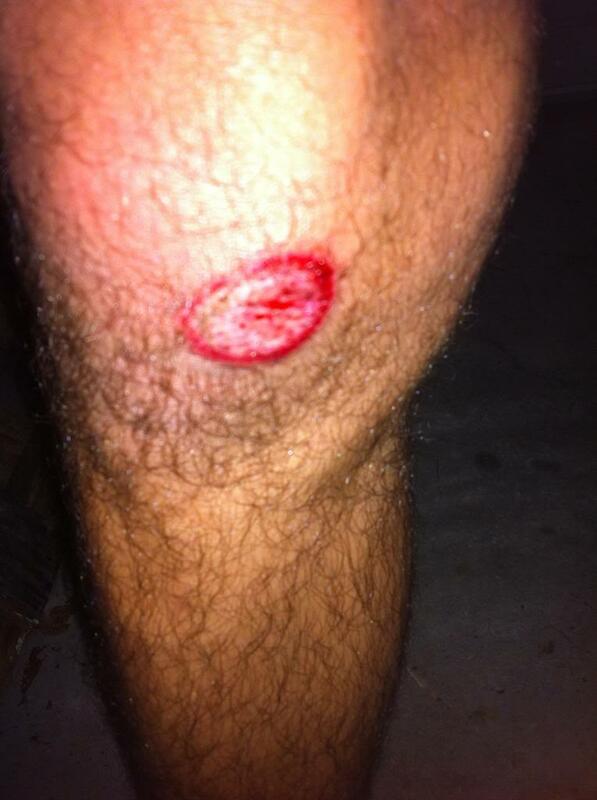 It just bothers me how much it hurts when it's uncovered and the fact that it is still completely raw. I showed my wife whom is a Registered Nurse and she thinks judging by the way it's blistering/bubbling she says you may be having a reaction to the gel bandage and thinks you should consider not using it anymore. She said some people take time to heal judging upon their persona history (I.e., diabetics, smokers, poor blood circulation,etc.) However what concerns her the most is that you're still in that much pain after a week. She still thinks you should have a doctor look it over. Not sure if this is any help but wish you the best. Thank you very much. Anything helps! Could you please ask her if I should leave it uncovered to dry out and scab? 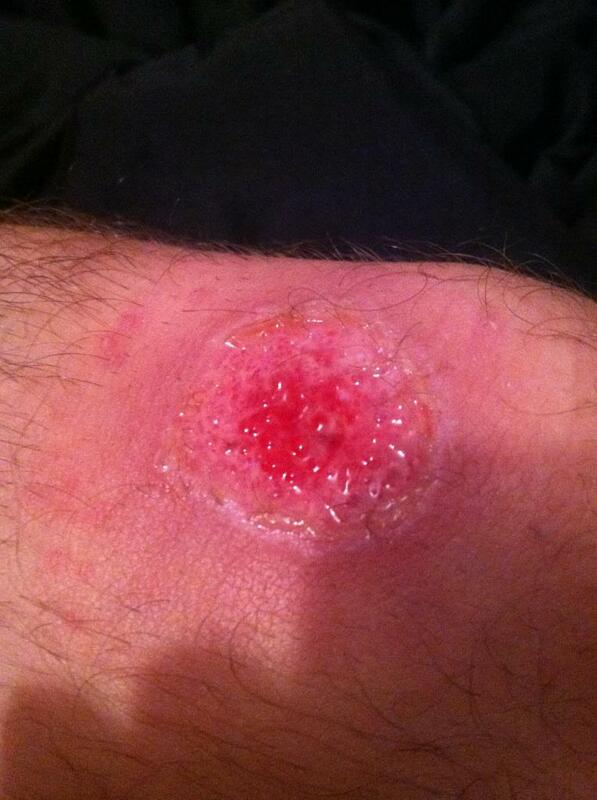 Or keep putting ointment on it while it heals and keep it moist? I've read both things and not sure which I should do. Can you take a photo of the box, or list out the active ingredients? Did you scrub the heck out of it? I just use bacitracin or neosporin with either band-aids or non-stick gauze bandages and let the wound air out for as long as I can stand, keeping the wound clean and well kept everyday. hope it helps. I've been changing the bandage twice a day - when I wake up and before I go to bed. The intense pain is only in the center of it where the bubbles are (and where it is deepest). I can't blotch it to dry it without insane amounts of pain. The edges are fine though. Yeah I cleaned that sucker like crazy when I got home from the ride. Soap + water from the shower then douses of hydrogen peroxide until the bubbles stopped forming. Since then I've just been using soap + water in the shower (2x per day). I just moved out of my house (from an abusive father) so I don't know if I'm on my father's health insurance anymore or what's going on, and I'm 18. That's the only reason why I haven't gone to my doctor yet. Otherwise I would've stopped in there the day it happened to make sure everything was a-ok. I'm going to try to let it dry out and scab tonight I think. It has dried out and hardened before, but the pain caused me to slap one of those gel bandages on it again to stop the pain. It had fully scabbed once, but because I bent my knee while doing some word working I broke the scab and out came the ooze. Since then I haven't let it scab because I read that it will heal faster and with less scarring if I keep it in a moist environment. As I sit here the pain isn't all that bad. The outside (probably about two thirds of it) looks like it's starting to build new skin and feels fine to dab, but the inside (about one third of it) is really red and that's the part that hurts. It's also the part with the pimple-bumps. Could the bandage have caused it to not heal and maybe that's why it hurts so much? My wife said to air it out when showering so soap can run over it and let it air out as much as possible until its dry after you get out out the shower. She said best thing is to let it air out while you're sleeping but you may be worried about rolling on it. 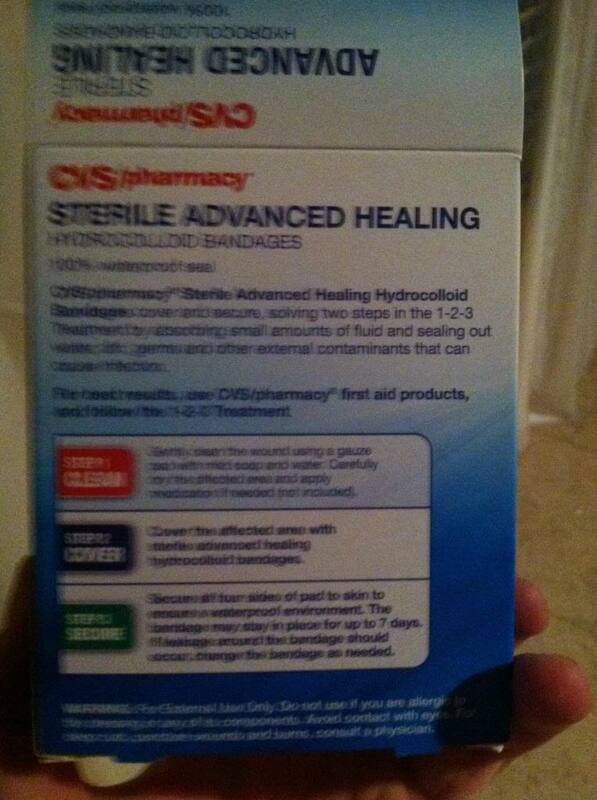 She said you need to use neosporin and wrap in dry gauze and use paper tape to hold it on throughout the day. Make sure to change the gauze every time you shower or clean it. Could the bandage have caused it to not heal and maybe that's why it hurts so much? She said possibly because it was always a moist environment which would make the healing process longer than normal. Also being that it was so deep the body needs a dry environment before it can start properly healing. Let us know how it goes. It looks pretty clean though. Hows the bike? Last edited by Conrice; 09-04-2013 at 04:21 PM. If you go to the doctor they will probably scrub it clean with something that has bristles like a toilet brush..
1. clean the ****, down some whiskey or something first. 2. 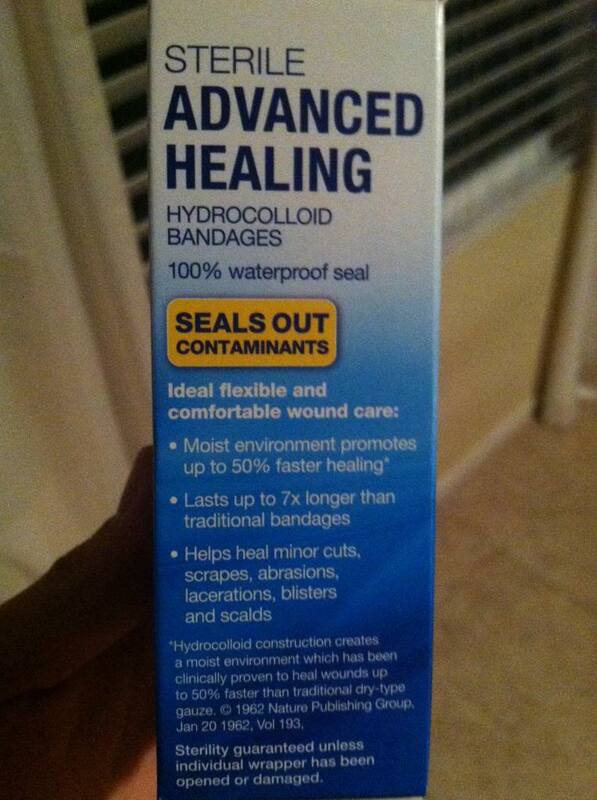 Run neosporine for a day or two. 3. keep clean, (different than cleaning) and let air dry until it heals. Everytime you get it wet/remove scab it has to rescab over and start over in that section. I have no medical background whatsoever. And advise you to not listen to anything above and seek medical treatment.